These wheat halwa is made using Levulose - A natural sugar alternate. These are Low Glycemic and DO NOT require insulin for their metabolism. Hence they are suitable even for Diabetics. All our sweets are clinically evaluated by leading diabetologists and have been proven as an ideal product for diabetics and are patented. Low Gycemic (GI19) Product. A Low Glycemic Product is Good for Diabetics whereas a High Glycemic Product is Bad for Diabetics. With a Low Glycemic Index of 19, it has been approved as safe for Diabetics and Health Watchers. It is Insulin Independent for its Metabolism. Hence even Diabetics can safely take it. It also enables good HbA1c (Glycosylated Haemoglobin) levels. It is 1.7 times sweeter than normal sugar. Hence Calorie Savings can be made for Weight Watchers. It provides Longer Lasting Energy and thus postpones temptation to snacking. Hence Ideal for Weight Watchers. It has a Lingering Mellowed Taste unlike Artificial Sweeteners. Diabetics Dezire Sugar-Less Wheat Halwa for Diabetics These wheat halwa is made using Levulose - A natural sugar alternate. These are Low Glycemic and DO NOT require insulin for their metabolism. Hence they are suitable even for Diabetics. All our sweets are clinically evaluated by leading diabetologists and have been proven as an ideal product for diabetics and are patented. 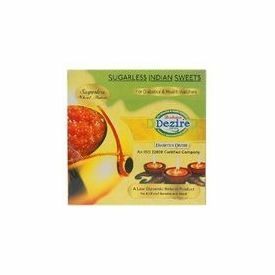 Best Before : 60 days from Packing Key Benefits of Diabetics Dezire Wheat Halwa Low Gycemic (GI19) Product. A Low Glycemic Product is Good for Diabetics whereas a High Glycemic Product is Bad for Diabetics. With a Low Glycemic Index of 19, it has been approved as safe for Diabetics and Health Watchers. It is Insulin Independent for its Metabolism. Hence even Diabetics can safely take it. It also enables good HbA1c (Glycosylated Haemoglobin) levels. It is 1.7 times sweeter than normal sugar. Hence Calorie Savings can be made for Weight Watchers. It provides Longer Lasting Energy and thus postpones temptation to snacking. Hence Ideal for Weight Watchers. It has a Lingering Mellowed Taste unlike Artificial Sweeteners.